Home > Alan Wofsy Fine Arts > H. Richardson, Architect. Photographs and Prints 1877-1892. H. Richardson, Architect. Photographs and Prints 1877-1892. New York: Spaced Gallery of Architecture, 1979. Offset lithograph and letterpress. 21 x 17 inches. The only reference to this gallery at 165 W. 72nd St. and exhibition on the internet in from New York Magazine Dec. 10, 1979, which references Harvard Law School. Austin Hall is building at the Harvard Law School designed by H. H. Richardson. The first building purposely built for an American law school, it was also the first dedicated home of Harvard Law. It is located on the Harvard University campus in Cambridge, Massachusetts, and was listed on the National Register of Historic Places in 1972. 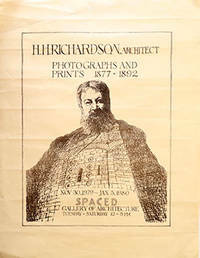 Title: H. Richardson, Architect. Photographs and Prints 1877-1892.